When you go to the movies, what is your snack of choice? Is it popcorn, candy, or maybe some yummy nachos with cheese sauce? Over the years, I have gone through different phases of what my favorite snack is when at the Movie Theater. When I was a kid my favorite movie snack was a big box of Sno-Caps candy. Then as I got older, when they started having nacho’s in the theaters, I switched over to nachos. Currently I am in the popcorn phase. I really do not get to the movie theater too much now with the children, so we try to have a movie night at home at least once a month. When we do movie night we like to make our favorite movie night snacks, bring out the pillows and blankets and dim or shut off the lights. We always make sure we pop plenty of popcorn since each kid likes to have his or her own bowl. 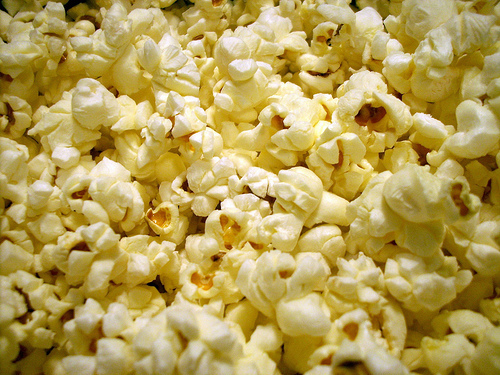 We usually have the bags of popcorn, but there is nothing like the taste of traditionally popped popcorn. Have you ever heard of the Whirley Pop popcorn popper? This popcorn maker is just like the one’s in the movie theater. It is a hand-cranked stovetop popcorn popper that allows you to have popcorn at home that tastes just like the popcorn you find at the movies. Since we are in the comforts of our home, we can enjoy other amenities as well, such as ice cream. My kids are huge ice cream eaters and love to enjoy a bowl of it anytime they can. Although this is not something commonly found in a movie theatre, it is something they can certain enjoy sitting at home while watching a movie. Do you have a family movie night tradition? If so, what is your movie night snack of choice?